Chinese Pig Trotter with Black Vinegar and Ginger is one of my favorite winter dishes. It is also recommended for pregnant women and during postpartum period. This stew aids to keep new moms warm during the first month after birth. There are a lot of collagen from the pig trotter, its bones, and the hard boiled egg. This is all beneficial for women’s health and well being. Because women then to have smaller and thinner bones than men, women has a higher risk of developing osteoporosis and broken bones. Between age 20 to 80, women loses one-third of the bone mineral density. So it is very important to replenish lost vitamins and minerals. The citric acid from the black vinegar aids metabolism and cholesterol reduction. Ginger helps digestion, improves the absorption and assimilation of essential nutrients in the body. Ginger also helps warm the body up. I’ve always loved this dish because of the of ginger aroma and the sweet and sour taste. Black vinegar contains many essential amino acids. Amino acids help repair muscle tissue and nail growth. Black vinegar helps to balance our body’s PH levels by neutralizing lactic acid and alkalizing the blood. 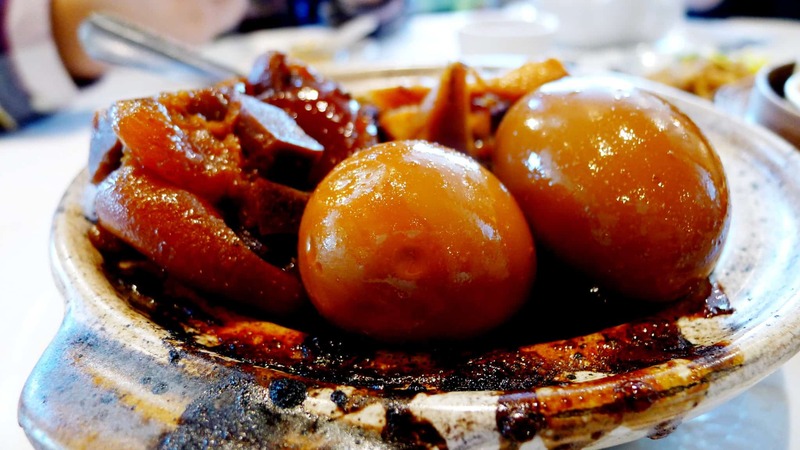 Every winter, I will eat a pot of Chinese Pig Trotter with Black Vinegar and Ginger to help fight aging. Making this pig trotter stew with black vinegar and ginger is actually very simple. But it takes time. Usually I will allow myself two days to prepare this. Some recipes online condenses the process into one sitting, but this is one that I’ve grown with. My grandma also emphasize on using both young and old ginger. She says you want the hotness from old ginger and the aroma from young ginger. You will want to both slice and bruise the ginger. To bruise the ginger, you simply pound it with a meat mallet or the side of your blade. Most people do not put red dates in their stew, but personally I like to add a few for that extra sweetness. Chinese red dates has a lot of health benefits such as: Vitamin C, Vitamin A, Vitamin B1, Vitamin B2, protein, calcium, phosphorus, iron and magnesium. Red dates are antioxidant and help stimulate the production of white blood cells. The iron and phosphorus in red dates also helps to prevent osteoporosis and anemia, both common in women. Chinese Pig Trotter with Black Vinegar and Ginger is one of my favourite winter dishes. It is also recommended for pregnant women and during postpartum period. This stew aids to keep new moms warm during the first month after birth. There is a lot of collagen from the pig trotter, its bones, and the hard boiled egg. wash and pat dry ginger. It must be fully air dried approximate 2 hours. Over medium heat, stir fry the ginger for 6 mins. Add 1 tsp oil, 1/3 tps salt, con’t to stir fry until ginger is fully dry. Otherwise wet ginger will promote bacteria and mold. Boil at high heat. When bubbling, add in previously stir fried ginger. Once boiling, Reduce heat to low and cook for 2 hours. Turn off the heat and leave overnight. Boil a hot pot of water, add a few slices of ginger, 4 tsp of shaoxing wine and pig trotters. Cover the lid and bring to boil. When it is boiling, turn to medium heat and cook for 30 mins. Once cooked, remove from water, and pat dry. Add to Day 1 cooked ginger and black vinegar pot. Boil at high heat. Reduce heat to low and cook for 2 hours. Boil hard boil eggs for 15 mins. Add salt to the boiling pot. Salt helps to keep egg whites inside the shell even if the shell is cracked. Shock in cold water and remove the shell. Add the hard boil eggs to the Day 2 pig trotter with black vinegar and ginger pot. Boil at high heat. Reduce heat to low and cook for 1 hour. NOTE: To preserve this pot, bring to boil at high heat at least 3 times a week. Until consumed. I typically like to keep it in the fridge and reheat when I feel like eating some. Optional. Add red dates to your Pig Trotter with Black Vinegar and Ginger stew. Remember to remove seeds from the red dates. Day 2 and Day 3 can be combined if you a lot yourself enough time. We hope you like this recipe and enjoy some warmth during the cold winter months! How do you normally stay warm? Let us know in the comments below.